As the longest tour in hip hop history, the Hostile Takeover 2012 Tour has covered nearly every region of the country. Going along for the ride, Stevie Stone has won over crowds everywhere with his charged-up performances of tracks like “808 Bendin'” and “Get Buck”. 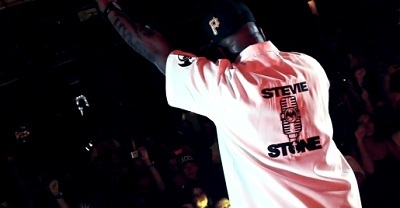 Watch as cameras take you behind the scenes in this exclusive footage to capture some of Stevie Stone’s best moments so far on the Hostile Takeover 2012 Tour. From meeting with his biggest fans to rocking stages with hits from Rollin’ Stone, Strange Music’s Stevie Stone shines bright in this highlight reel and it’s only the beginning. Be a part of every wild moment and don’t miss the Hostile Takeover 2012 Tour! CLICK HERE FOR TICKETS AND VIP EXPERIENCE PASSES TO THE HOSTILE TAKEOVER 2012 TOUR. Have you seen Stevie Stone live?